“The Sturt Pea” is an A4 magazine published at the beginning of each month by the Shire’s Community Resource Centre. The deadline for articles and advertising submissions is usually one week before the end of the previous month. Submissions can be emailed in MS Word, MS Publisher, PDF or JPG format to crcassist@laverton.wa.gov.au or can be delivered to the Shire of Laverton Office, 9 MacPherson Place, Laverton or the Community Resource Centre, 4 Laver Place, Laverton. 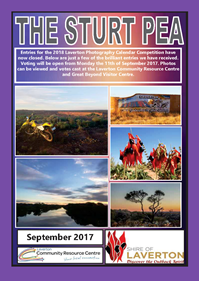 Copies of “The Sturt Pea” for the current year can be downloaded by clicking the links below, or you can contact the Community Resource Centre to have an electronic copy emailed to you each month.